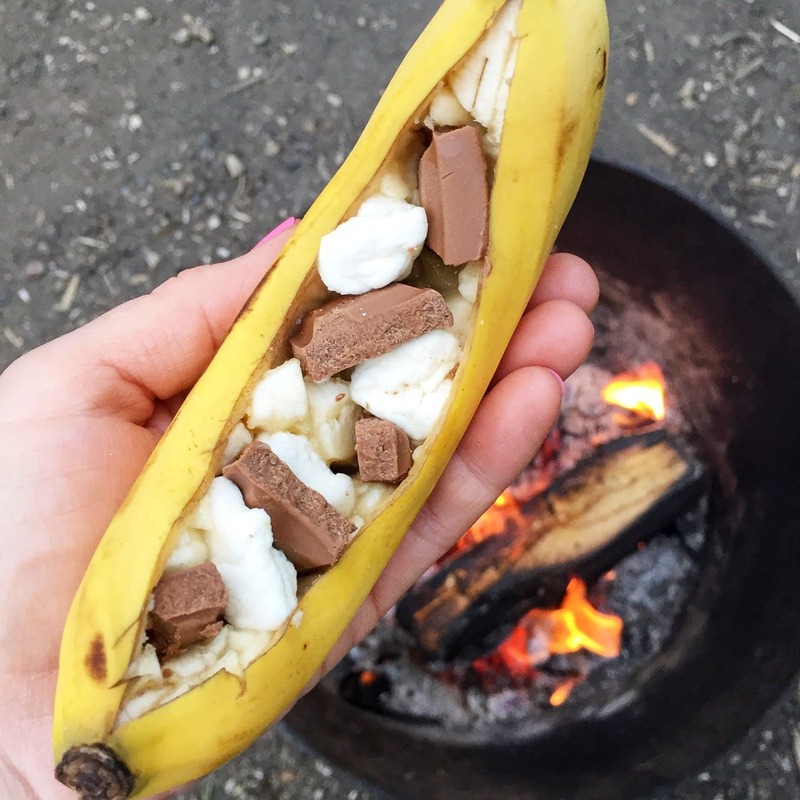 15+ easy recipes to make your next camping trip the most delicious yet! Anyway, to make your camping life a little easier I rounded up some delicious dishes that we eat on our trips. Many of them are simple to make right on site, others require a little prep at home but are pretty much ready when you get to where you’re going. The key is, if you can get your food prepped ahead of time, you have more time to spend doing what you love to do while enjoying the great outdoors! And for an added treat, I’ve teamed up with 8 other great blogs to bring you more fun glamping ideas! So here we go…let’s go glamping! These breakfast sandwiches are delicious enjoyed in the great outdoors! Just simple ingredients for a hearty start to your day! There’s nothing quite like pancakes cooked over the campfire! This tried and true buttermilk pancake recipe is perfect for camping. Mix up a batch of the dry ingredients before you head out camping, then just add eggs and milk when you’re ready to make them. Eating pancakes in the great outdoors is one of life’s greatest pleasures. The great thing about these camping tacos, is that every camper can make their very own bag for dinner! 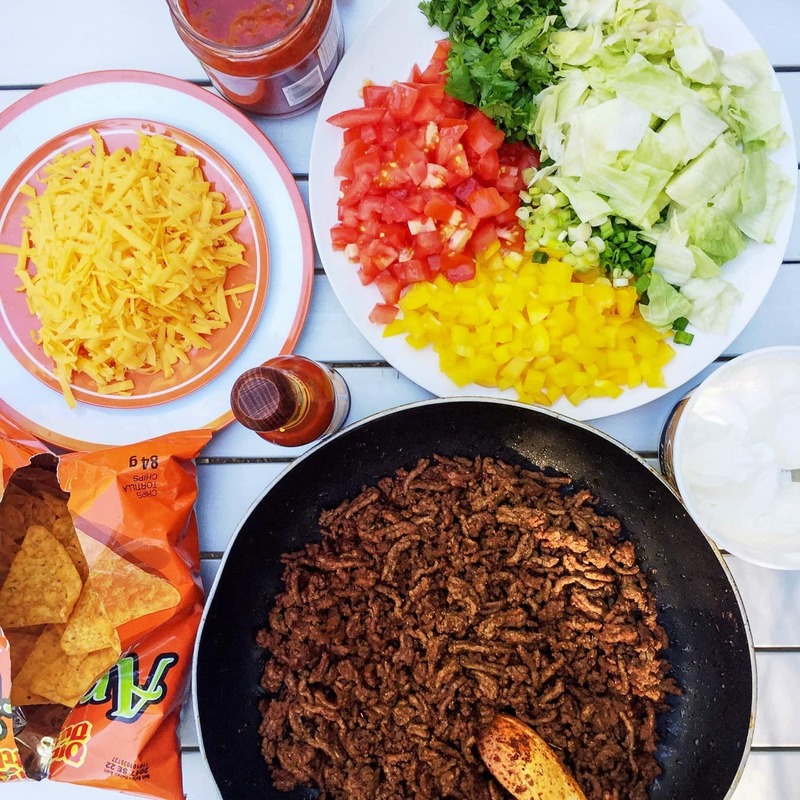 Make them with your favourite nacho chips, and all of your favourite taco toppings! Get the full recipe here. Make up a batch of trail mix before you head out camping. This mix is perfect for snacking – you can pack it up in individual containers/ziplock bags and take them with you when you hit the trail! Or you can enjoy it for breakfast as well! A hearty & delicious breakfast that can be easily tailored to your tastebuds! We like ours with breakfast sausages, onions, leftover potatoes and peppers. I like to make this chili ahead of time and bring it along on our camping trips all ready to go. Just heat over the campfire and serve! This is so appreciated after a long day outdoors, especially on cold camping days – it fills and warms you up! These are always a big hit on our camping trips! Just pre-cook the beef at home, then assemble the nachos in a tin pan, cover and heat over the campfire & serve. Make sure to pack along salsa! Yes! You can bake a ham over the fire! And the leftovers are great for breakfast and ham sandwiches for lunch. These can be assembled at home (uncooked) and transported in a disposable container. Just cook them directly on the grill or on a piece of tin foil. This is my favourite camping meal of all! 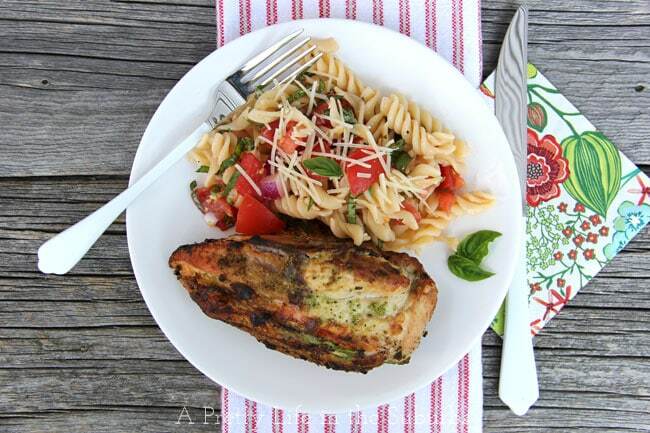 A hearty & delicious campfire meal! Skillets are great because you can tailor them to your tastebuds, not to mention the fact that cooking a dinner in one pan is the best! These can be assembled at home (uncooked) and transported in a disposable container. Just cook them directly on the grill or on a piece of tin foil. These are a little more fancy…definitely glamping food! Need I say more? 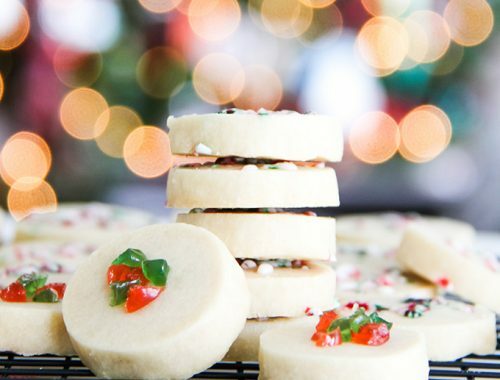 The only thing we’d do different with these next time is to wrap them in more bacon. 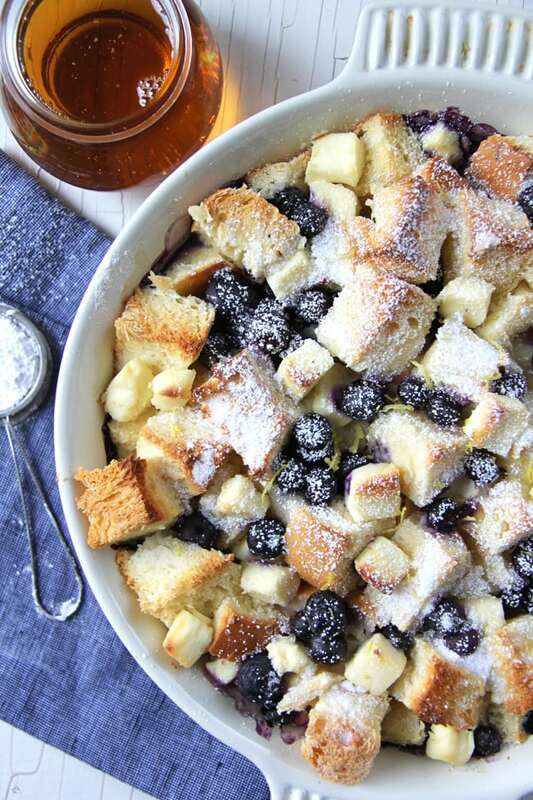 This one-pan recipe is so simple to assemble and cook over the fire! And it will almost leave you feeling like you’re fine dining, but in the woods, with dirty hair and clothes. Campfire potatoes are the best! They just get all crunchy and delicious cooked over the fire. We always make a big batch so we can use the leftovers for hash browns in the morning. Yum. I’m not sure if this is a salad or a dip? At any rate, it’s perfect for lunch (or a snack) served with nachos. SO good! You can’t go camping without s’mores! It would be a crime. One way to have the making of s’mores be easier is to take all of the ingredients ready to go: remove all the wrappers and put all the s’more supplies in one easy to access container! Now let’s see what my friends have been up to! 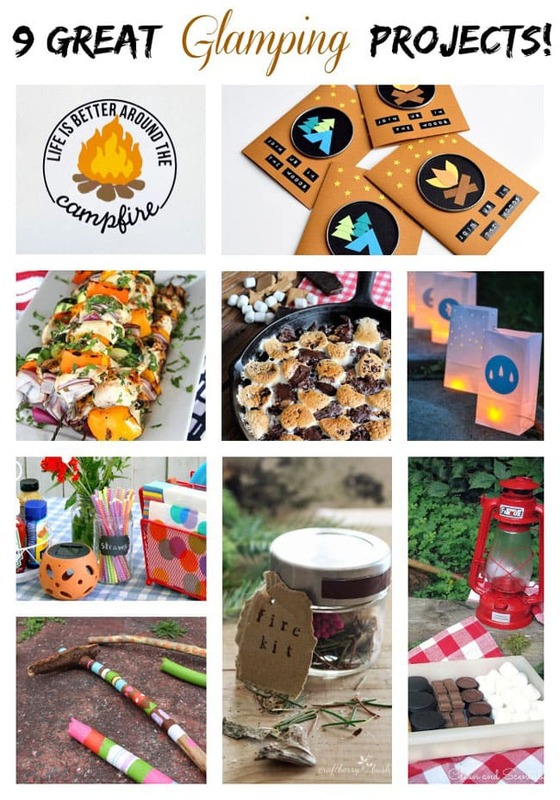 Get inspired for your next “glamping trip” with these amazing projects! Those recipes sound amazing. Ham idea sounds awesome! Thanks Angie! We really love camping and find it so fun to try new things when we’re out there – everything tastes better over a fire! Wow, you really go over and above the typical hot dogs and hamburgers. Let me know when your next camping trip is and we’ll park ourselves beside you! Enjoy your weekend (sun is maybe trying to peek out today??). Oh don’t be fooled – we eat a lot of hotdogs too! tee hee They’re the best when they’re roasted over a fire! Have a great day tomorrow – it’s going to be a sunny one! I love this, Jo-Anna! While we love a good hamburger, it’s nice to have something a bit fancier for a camping dinner! I’m going to peruse these and pick a few for our next trip! Thanks Tara! We eat a lot of hotdogs and smokies when we’re camping too – there’s nothing like eating a hotdog roasted over the fire! YUM! So I’m thinking you should have me over this summer for a camping party!! I want to try all those delicious dishes!! YUM! I want to come camping with you! Everything looks too good for around the picnic table! I’ve added a few must trys to my list! I’d love to camp with you…I bet it would be a blast! Wow! You are the queen of camping cooking!! I really need to go on a camping trip with you!! lol! Esas recetas se ven muy ricas!!! I think we’re going to take the kids camping for the first time ever this summer! 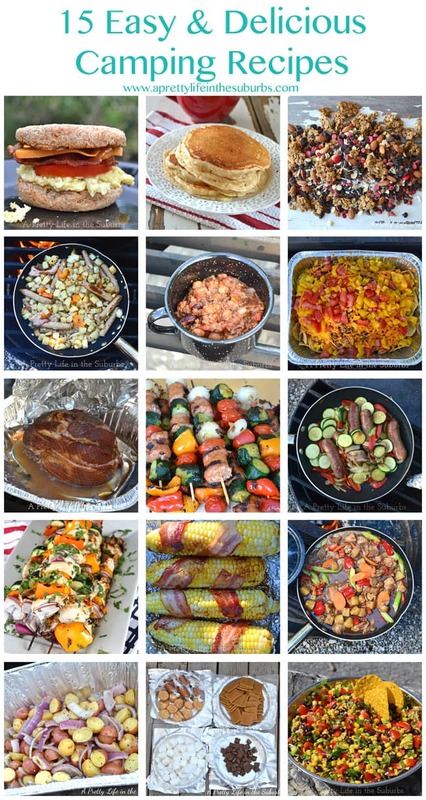 Can’t wait to use some of these recipes… pinned to my camping board so we can plan ahead! Oh have so much fun! Camping is the best! I’m going on a mission trip and thought I’d take a peak at your ideas since we will be cooking with limited supplies. I have a few new ideas to bring on the trip with me. I like the idea of making the potatoes and making extra for the next day’s breakfast. Perfect! I’m so happy you were able to find some ideas! Have a great trip! These are great for those of us who don’t camp, but like to enjoy our backyards. Thanks for sharing on Sunday’s Best. Thanks for sharing your post with the #homemattersparty. We’re so glad to have you.